Throughout your career you’ve played with an incredibly diverse range of artists, do any of these experiences particularly stand out? I know! I really consider myself the luckiest to have had the chance to perform, record and tour with so many amazing artists through the years. I have fantastic memories with each one of the projects I've been involved with. If I had to choose one, it would most probably be the recording session with Adele for her album 25, back in 2014. I have always been a huge fan of her music through the years, so getting to spend a few days in the studio with her and some of the most ridiculously talented musicians I've met it was like a dream come true. I play guitar for Sophie Ellis-Bextor, who is a total pleasure to work with. I love the musical mixture of genres, from her latest pop/folk/singer songwriter material from her latest albums to the full on disco anthems she's so well known for. There is an amazing energy in the band and great friendships, which makes every performance or session such a fun experience. I also play guitar with Australian dream pop singer songwriter Lucy Mason. We have been gigging and recording together for many years now, so apart from loving her music and her voice we've become really good friends. These are the two main projects I'm involved with at the moment, plus all the one-off work I do with different artists, producers, etc. You’ve recorded with the legendary Paul Epworth, what was he like to work with? Paul is just the best, apart from being the nicest person, he's a force of nature when working in the studio. He's been kind enough as to invite me to a few different recording sessions through the years (his studio the Church in North London must be the closest place to paradise for any musician) and each time I've learnt so much from him. He always shows the perfect balance between being driven and having a million ideas going through his mind, while leaving a huge amount of freedom to the musicians to experiment and bring their voices and input to the project. As much as I absolutely love the thrill of a good live gig, there is something about the studio work which gets me every time. Maybe it's my "scientist side" that loves the experimentation with sounds and parts, having the song as the ultimate goal, like finding the right components to a very complicated chemistry formula. Tell us a little bit about your TV and film soundtrack work? What got you into it? Through my childhood and teenage years, I studied classical guitar in my hometown Madrid. 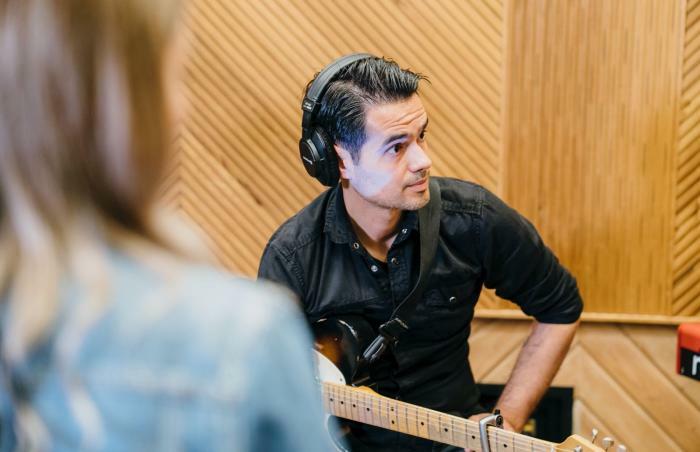 With time, and especially after moving to London a decade ago and getting involved in the pop music industry, I moved onto electric and acoustic guitar playing, but the classical background has proven to be very helpful. Maurizio Malagnini, an incredible film music composer, was one of my teachers at university and he got in touch with me to record some classical guitar parts in a movie called "The C Word" that he was scoring by then. After that, I've had the chance to do some more soundtrack projects with him and other great film composers (such as Peter Salem or Nikolaj Torp). I guess being trained as a classical musician gives you the discipline to follow what film composers need for their music, which is something so carefully planned and detailed. Nothing is left to chance, everything is written down and you have to stick to that as well as you can. It's interesting how it's pretty much the opposite of how things usually work in a pop music situation! Playing Glastonbury Festival last summer with Sophie Ellis-Bextor was a very meaningful gig for me. Such a legendary festival with an amazing energy... I really had an incredible time. When I was ten years old I was visiting my cousin's family in a small town on the west coast of Spain. He was a teenager and was already very good at playing Metallica and U2 on his electric guitar (to me, he was the coolest cousin ever as you can imagine!). He had a very old classical guitar that he didn't use anymore and gave it to me to take home so I could start learning how to play. I remember the morning we were leaving we forgot the guitar and I made my parents turn around so we could retrieve it, I couldn't leave without it! Who knows where would I be now if we had left that guitar behind! For the last couple of years, I've been mainly using two Fender road-worns made in Mexico which I bought mainly because they looked amazing and later realized they are actually very fine instruments. My Stratocaster has that Eric Clapton pickup system which incorporates a 20dB booster on the last tone knob of the guitar (making the central tone knob the only one for all pickups). It's like having a pedal incorporated on your instrument, such a clever idea! My Telecaster is the most gorgeous looking one, and it has a Bigsby bridge which I absolutely adore. I also have a very nice 1988 Epiphone Sheraton and a hollow body Gretsch for when I need to keep it vintage in sessions. Tell us about your Sunset, Timeline and BigSky, what made you chose them? The first Strymon pedal I ever saw and heard was a BlueSky owned by a friend of mine. He played some shimmer magic and I completely fell in love with how beautiful and organic the sound was. 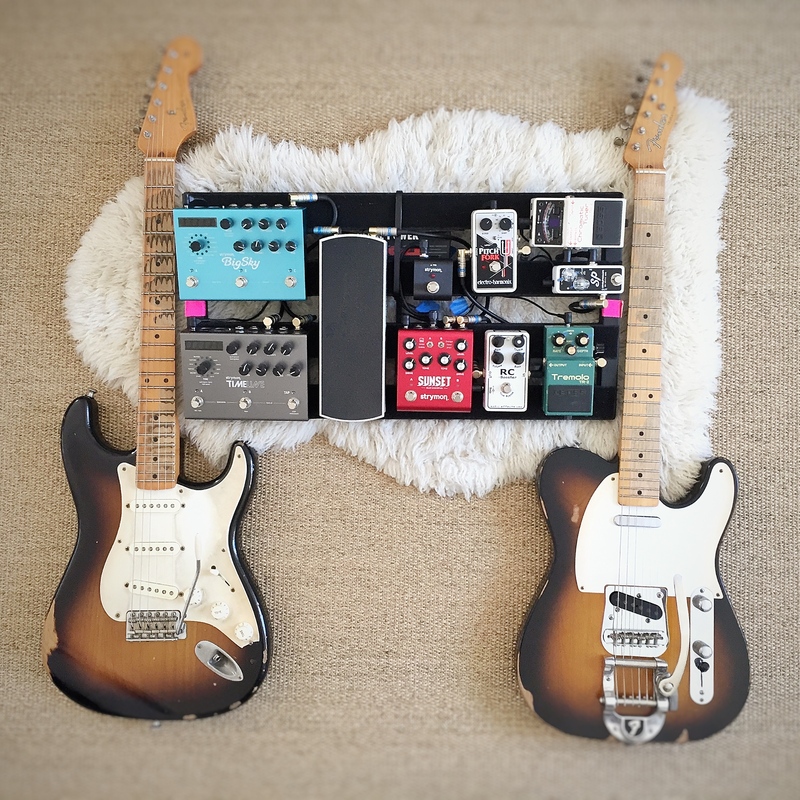 Then, after watching a million different videos of Strymon pedal demos and reviews, I went ahead and got a Timeline and a BigSky for my board and have been using them since then. I am not a super techy guitarist and I possibly use just 3% of what these pedals can do. However, having the option of endless tweak-ability in any circumstance is amazing. Especially for recording sessions, you can spend hours experimenting and finding incredible sounds for every song and situation. I keep it considerably simple: I use an indestructible Boss TR2 tuner and a compressor and light booster (both from Xotic pedals) which are pretty much always on, to fatten my signal and make things more even. I use a modded tremolo by Boss, a fun pitchfork pedal from Electro Harmonix for when I want to make things a bit more weird-sounding, and a volume pedal. Over the years I've been trying many different drive pedals. One that I have used for years and I totally love is the Morning Glory by JHS pedals. But I just recently got a Strymon Sunset and I have to say I'm totally amazed by how good it sounds. Incredibly versatile pedal that offers an enormous range of tones and drives, and is super responsive to your playing. For a while I used a Fender Jim Adkins thinline Telecaster with the most amazing neck and a couple of P90s that sounded like thunder. It’s one of the most comfortable guitars I've played, but I had to let it go to get some other gear. Can't keep all the guitars I'm afraid! A couple of years ago I got in touch with a small company from the US that just put out this little invention called the Tonewood Amp, a little device that you attach to the back of your acoustic guitar and produces different effects by vibrating the wood (reverb, delay, even a crazy autowah) coming out of the guitar sound hole. They were kind enough to send me one to try and I absolutely loved it. It actually changed considerably my playing on acoustic guitar. It's amazing how just a little bit of nice reverb on your sound (without the need of cables or amps involved) can inspire you so much. I use it all the time, when practicing, in lessons, small gigs... I actually call it my "inspiration box". Work hard and be nice to people. It really is down to that.